We need to have a look at the Japanese (originally Chinese) character for sake. Pretty isn’t it? The right-hand side kinda looks like an jar with a lid, no? …like this. Here we’re just left with the jar and the lid, i.e. something to hold the sake, which is the origin the character. 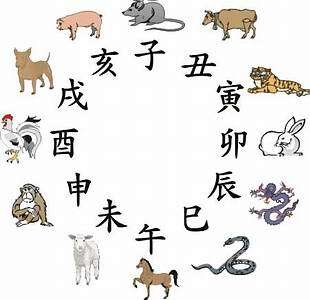 The Chinese zodiac (remember the origins of Japanese characters are Chinese) are twelve animal characters used to number years in a specific sequence. As you can see from the diagram on the left, the 10th zodiac sign is rooster or chicken. Those of you familiar with kanji will recognise that the character used here is not the usual, modern character (鳥) but rather our familiar, ‘half sake’/jar character form above. This is because the zodiac uses traditional, old characters for each of the animals. 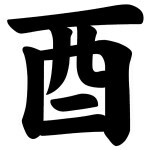 One reading of this character is ‘toh’, a synonym for ten in Japanese, which is why it is associated with the tenth year, month (October) and hour. So! We have the idea of the tenth month of the year being associated with a particular character which is, coincidentally, also the (old) symbol for sake. Furthermore, sake production starts roundabout October so this all neatly ties together and results in Sake Day being 1st October. I told you it was complicated. I can’t take too much credit for this article as I’ve lifted it almost word-for-word from sake guru and legend, John Gaunter, I just thought my readers might be interested! Thanks and credit go to him for this information. His blog is excellent, check it out.